It’s my birthday month and I’ve decided that I want to do something a little different this time around. I’m going to be 45 on August 20 and I’ve been doing some reflecting. I’m very likely in the 2nd half of my life now for sure. As I reflect on that, one thing is clear to me…I want to add value and leave a lasting impact. When I traveled to Iraq in January of 2016 I met some TREMENDOUS people. All of whom were new to Erbil after being forced to flee ISIS in their hometowns. They need ongoing help to live and thrive. These are some of the most incredible people I have ever met! They lost EVERY material possession in most cases, fleeing with what they could stuff in a car with their family as they rushed out to survive. They could easily be depressed or angry at this. However, they are so upbeat and giving, contributing to the needs of others who were displaced already. It’s amazing to me! Those who lost everything, reaching out in whatever way they can to help others! It’s a powerful witness of Christlike love in action. So I want to help them more. I was there, I got to know them and got to help a little. I want to stay with it and keep helping. I can’t imagine any who I would want to help more than these dear folks who are so full of the joy of the Lord, serving others, and mission minded. They can do so much in their new city and beyond. I want to enable that to keep going. I want to raise $450 for my 45th birthday for them. My deadline is August 20 when I hit the 4-5 marker! I’m asking those who know me to consider a small gift, something like $4.50 (note the 4-5 association? LOL) or double that and go $9. I’d also love to see a few $45 gifts and of course I’d be ever so grateful for a $450 donation! 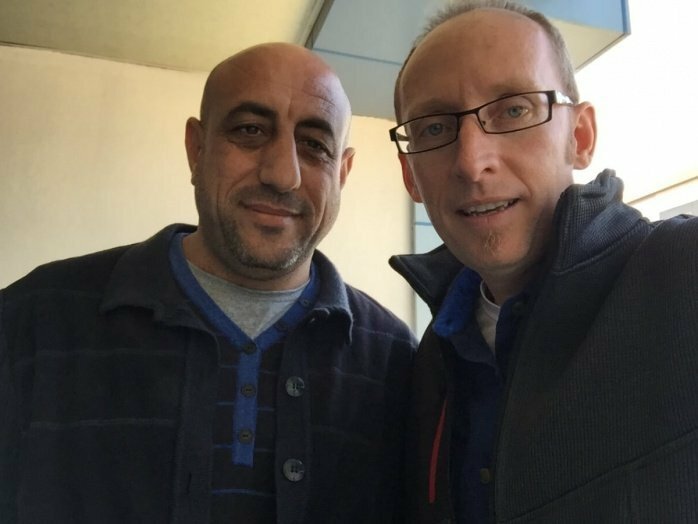 There are tremendous stories of men like Saad and Rabee, both of whom had to flee and leave behind professional careers. Each now is playing a crucial role in the support of other displaced Iraqi’s in the Kurdistan region. You can listen to my interview of Saad here. And read story #2 about Rabee on this page: Good rising from the evil of ISIS. 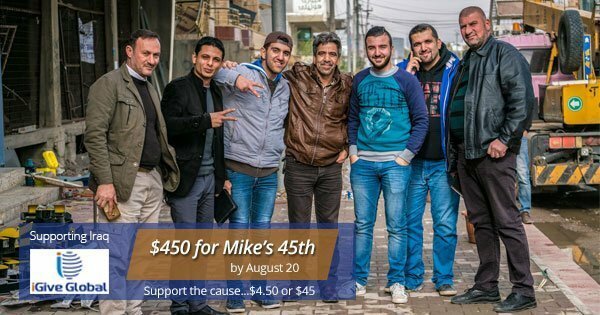 Will you consider giving support and helping me exceed $450 by my 45th? Thanks for considering and thanks for making my 45th special! Did you catch in the video I’m also celebrating by doing a team triathlon on my birthday, August 20? I’m jumping into 45+ with gusto! Add value. Be uncommon. The world needs us to share the love and life of Christ with others.